Home » show and tell » Rho’s Polka Dot Quilt – "Final Destination"
Rho’s Polka Dot Quilt – "Final Destination"
This is the final resting place for the “Polka Dot”Quilt. I won the blocks in the Block Lotto in Dec. 2009. 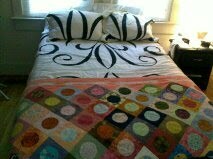 I have posted pics before of this quilt…………….. but I have always wanted to show it….. in final – on my sister’s bed. The URL is my webshots page which shows the entire progress while constructing. Take a look/see. We LOVE the Block Lotto! Yes we do! Our blocks look good on your sister's bed! OMG! That looks like it could be in a quilting magazine. Or a Better Homes photo shoot. I can't believe how fantastic the bed linens look with the quilt! I would NEVER have thought of mixing those prints and yet they are fabulous together! GREAT JOB! Brava!